No matter how hard you may try, it is extremely difficult to keep furniture and other upholstery clean. Plus, if you have kids or pets, it’s just that much harder. At Temecula Valley Chem-Dry, we understand that battle! Thanks to Temecula Valley Chem-Dry, your furniture doesn’t have to stay dirty. Routine furniture cleaning can make your home feel fresh, clean, and new. Our upholstery cleaning service also cuts down on bacteria and odors in your home. Before you think about replacing your furniture, give Temecula Valley Chem-Dry a chance to save it with our professional upholstery cleaning. Chem-Dry® gives the ultimate clean to your furniture by lifting the dirt and soil that’s buried within the fiber to the surface. Then, we whisk it away with our powerful extraction equipment. What’s Chem-Dry’s secret? Millions of tiny effervescent bubbles. Our carbonating solutions dive deep into your upholstery and explode dust and dirt off the surface. After this, we utilize hot water extraction to eliminate dirt particles to guarantee a thorough clean. Our safe, non-toxic solutions keep your furniture stay as clean as they were when they were new. We wondered just how effective our Hot Carbonating Extraction (HCE) cleaning process was. So, we called up a leading independent lab to test it out. 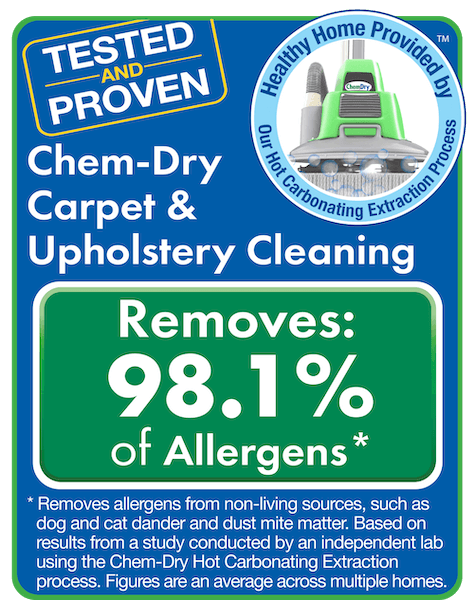 The lab came to the conclusion that Chem-Dry’s HCE removes an average of 99.1% of common household allergens from upholstery. The allergens tested were dog and cat dander and dust mite allergen. Additionally, they found that our HCE process, with a sanitizer added, removes an average of 89% of the airborne bacteria in the home, improving indoor air quality. Zero dirt-attracting residues which can prematurely re-soil your furniture. This means you save money on future cleanings. Contact us today to learn more, or schedule your next visit online today with Temecula Valley Chem-Dry! Schedule an Appointment with Temecula Valley Chem-Dry Today!